These simple cards, 7.5 cm by 10 cm, have a lower case letter of the alphabet on one side and a picture on the other. The picture side is covered with a gloss laminate. The font is the Sassoon Infant font and both versions of the letter 'k' (loopy and straight) are included. Four kinds of symbols on these cards. c,a,o,d,e,g,q ・・・These letters are formed with an anti-clockwise motion as in the letter c. The cards all have a green caterpillar on them. 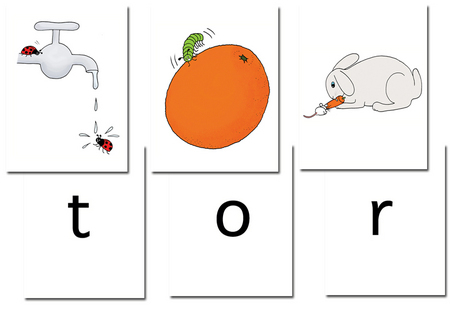 l, i, j, t, u, y ・・・These letters are all formed by a down stroke which then goes off in another direction. The cards all have a ladybird on them. b, h, k, m, n, p, r ・・・These letters are all formed by a down stroke, which is retraced, the followed by a clockwise curve. The cards all have a mouse with a long tail on them. s, f ・・・ The letters s and f are also formed in an anticlockwise manner, but them they change direction. They have no symbol on them. v, w, x, z ・・・ The letters v w x z are zigzag letters. These are no symbols on the cards.